According to paidContent, News Corporation’s new iPad publication, the Daily, will be launched on 2 Feb, a little later than previously rumoured. An invitation sent out yesterday by News Corp chief Rupert Murdoch revealed that the Daily will be launched at the Guggenheim museum in New York. Steve Jobs, now on medical leave, was to appear with Murdoch at the launch. Instead, iTunes guru Eddy Cue will represent Apple. One thing hasn’t changed: as James Murdoch affirmed earlier this week, subscriptions to the News Corp iPad ‘paper’ will run 99 cents weekly. This entry was posted in Editors' pick, Online Journalism and tagged app, News Corp, paidContent, the Daily on January 28, 2011 by Rachel Bartlett. Culture secretary Jeremy Hunt announced today that he will delay his decision over whether to refer News Corporation’s BSkyB bid to the competition commission. Hunt said that he is “minded” to refer the bid, but will hear undertakings from the merging parties before making his decision. BSkyB bid – a timeline on Dipity. This entry was posted in Business, Politics, Press freedom and ethics and tagged BskyB bid, culture secretary, DCMS, department for culture media and sport, Jeremy Hunt, News Corp, News Corporation on January 25, 2011 by Rachel Bartlett. Media and entertainment union BECTU is calling on its members to ask their MPs to support the referral of News Corp’s BSkyB bid to the competition commission. “Action is easy and takes a matter of minutes. Visit 38 Degrees and enter your postcode to email your MP directly. If you have yet to sign the petition please do so now,” says a release from the union. The union has also called on culture secretary Jeremy Hunt, who is responsible for making a decision over the bid, to publish Ofcom’s report into the proposals, which was delivered to his department on the 31 December. Speaking at London School of Economics last week, Hunt refused to comment on process or when a decision would be arrived at. He also declined to reveal when the Ofcom report would be published. His appearance at the university was interrupted by a demonstration over the bid. Representatives from BECTU attended a meeting about the bid and media ownership at the House of Commons last week. Speaking at the meeting, Lord Razzall said that “all hell will break loose” if Hunt were to ignore a recommendation from Ofcom to refer the bid to the competition commission. 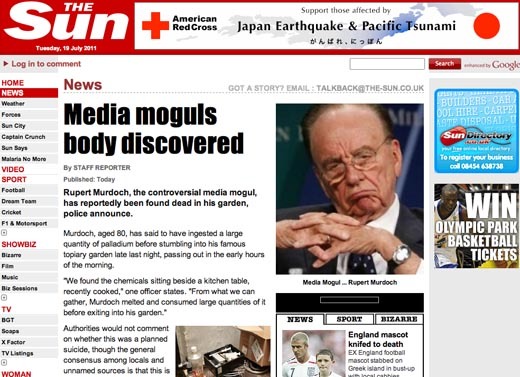 This entry was posted in Broadcasting, Politics, Press freedom and ethics and tagged BECTU, BskyB bid, DCMS, department for culture media and sport, Jeremy Hunt, News Corp, Ofcom, Rupert Murdoch on January 18, 2011 by Joel Gunter.